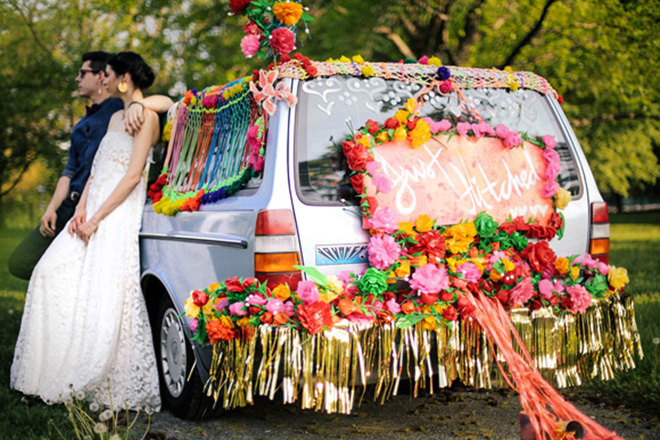 15 Awesome Ideas To Embellish Your Wedding Getaway Car! 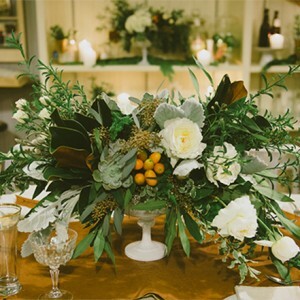 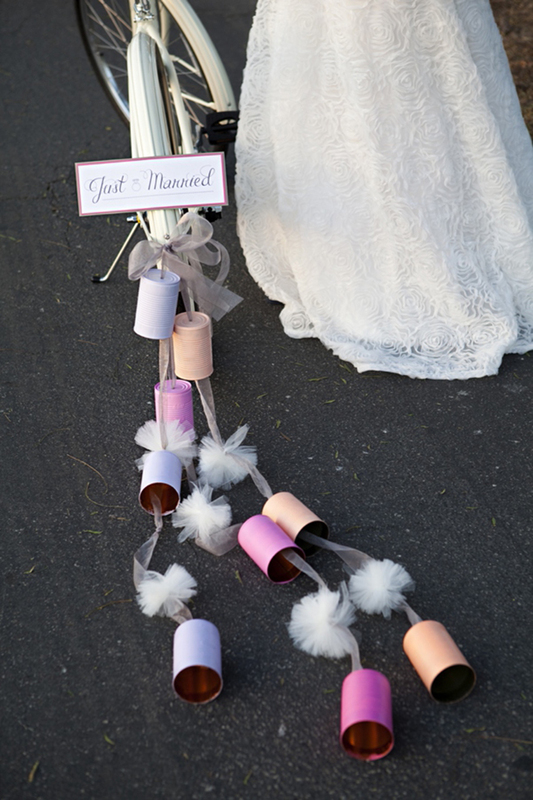 We all want to leave a lasting impression upon exiting, especially on your wedding day. 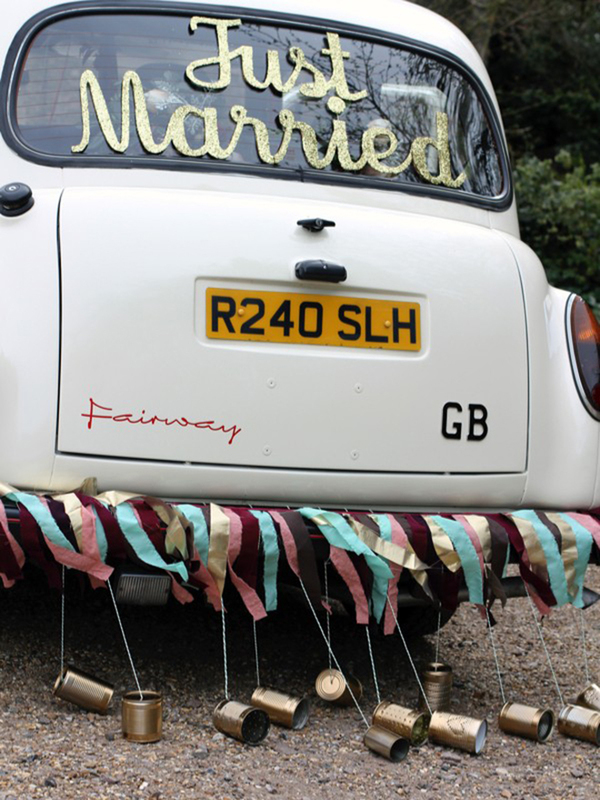 What better way to do that then with a souped up getaway car? 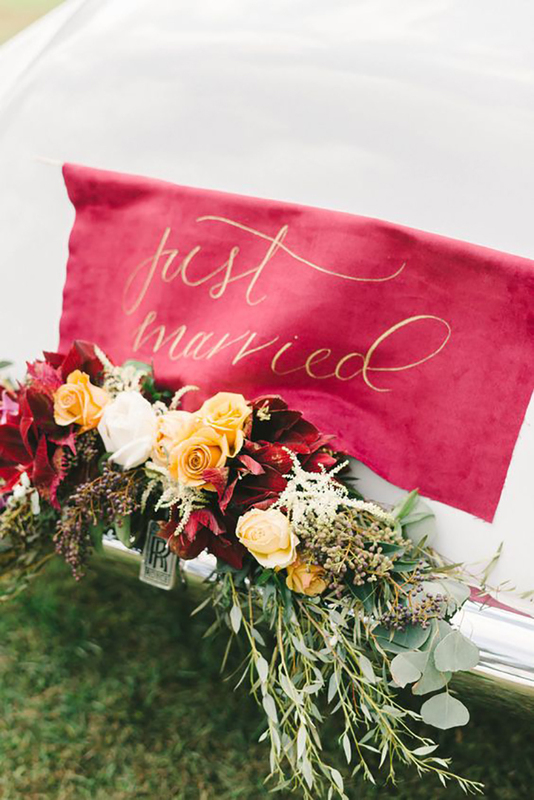 Whether you use your own car, a fabulous vintage rental or even a bicycle, your exit from the church, ceremony or the reception is a moment to make a splash and capture an amazing memory. 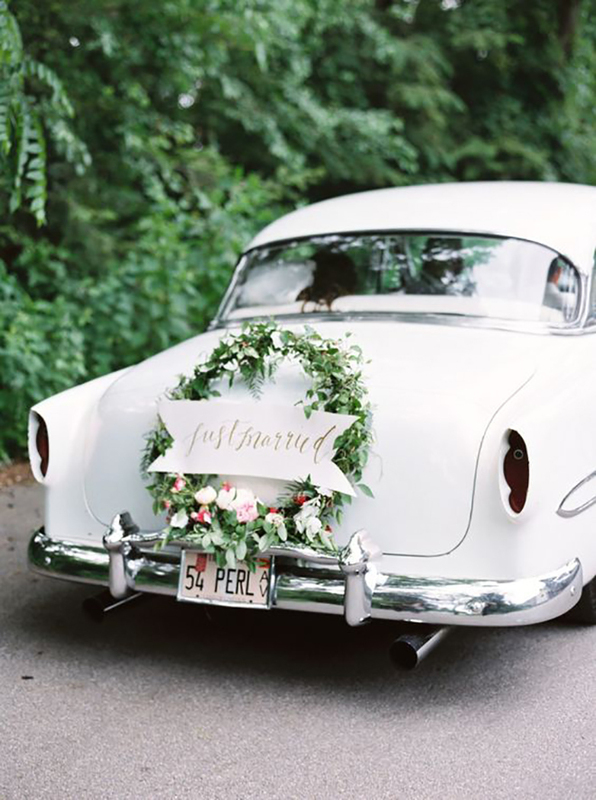 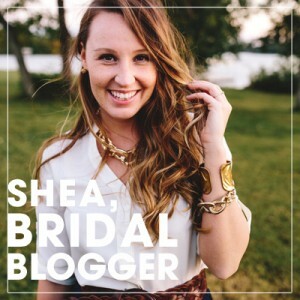 It’s Lauren from I Love Love Events sharing ideas from one of my absolute favorite details from a wedding day, the getaway car decor. 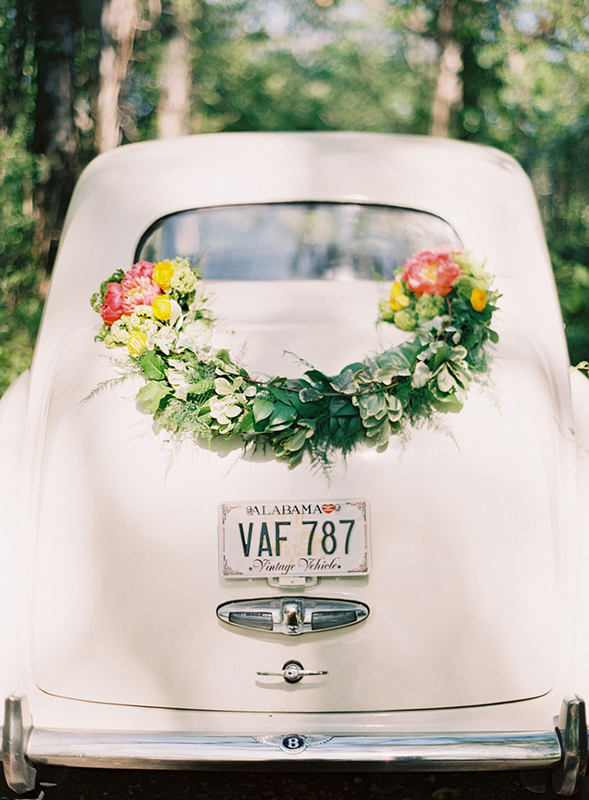 Vehicles are very important and very personal to people. 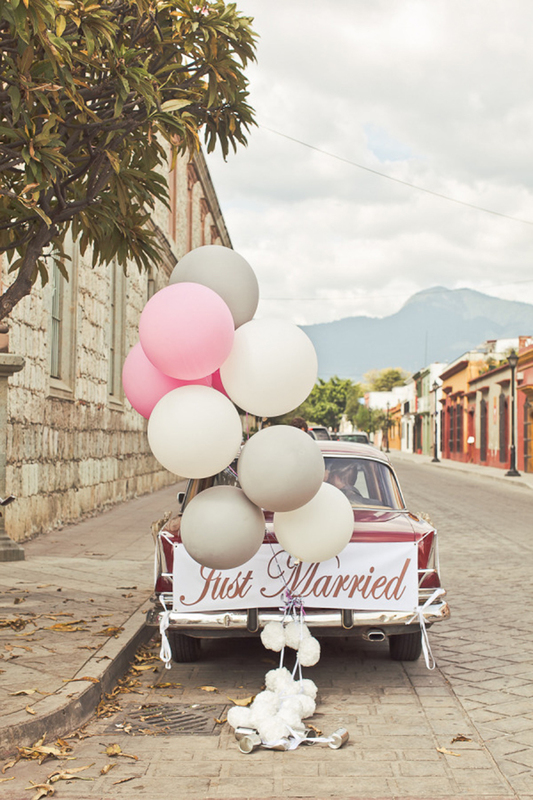 Maybe your getaway car is a key part of your story, perhaps it’s where you first kissed or maybe you fell in love on your first road trip together or it’s the car he drove you to the beach to propose. 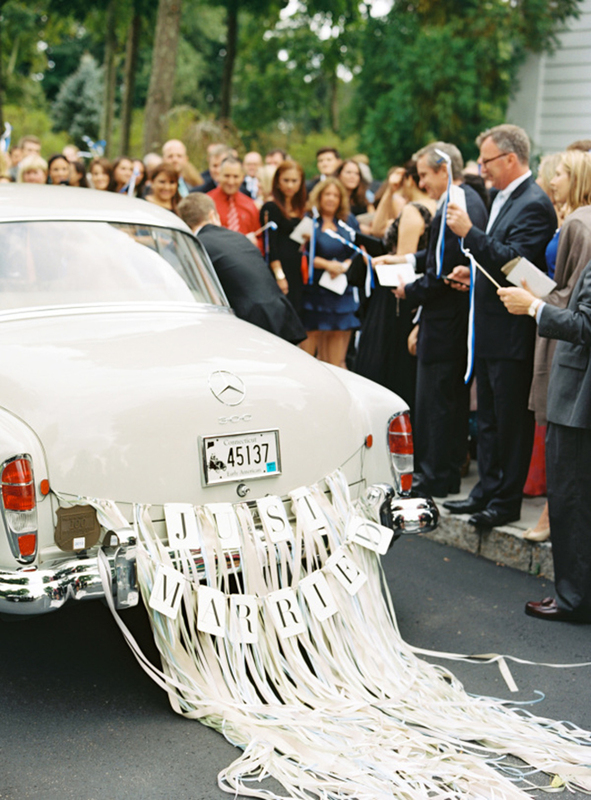 Or maybe, the car is an element that the groom is really excited about. 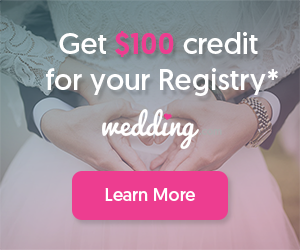 What better time to rent the classic of your dreams than your wedding day? 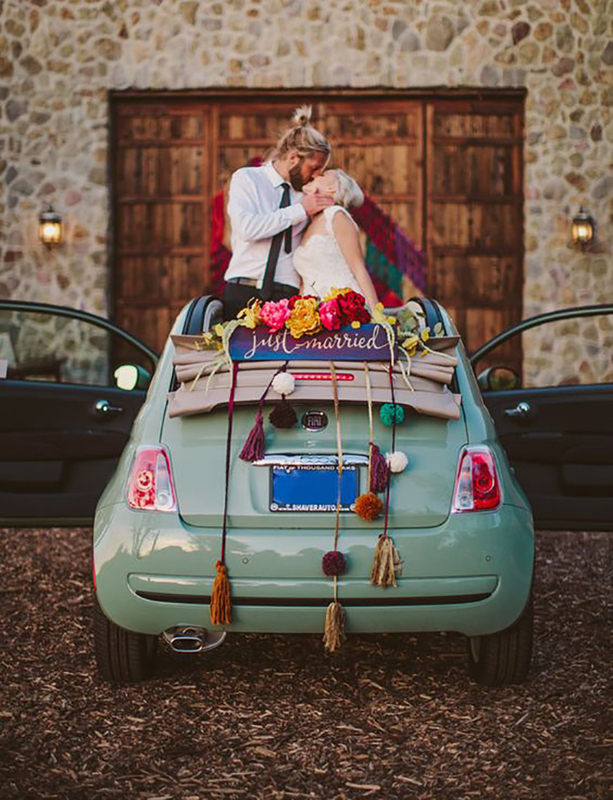 In my case that rental would be a fabulous vintage, turquoise VW Bus, but an old pick up or a classic limo might suit you better. 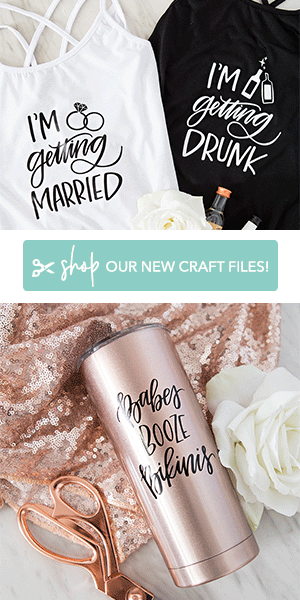 The sky (or more realistically your budget) is the limit, and this is a moment to have fun and let your personality as a couple shine. 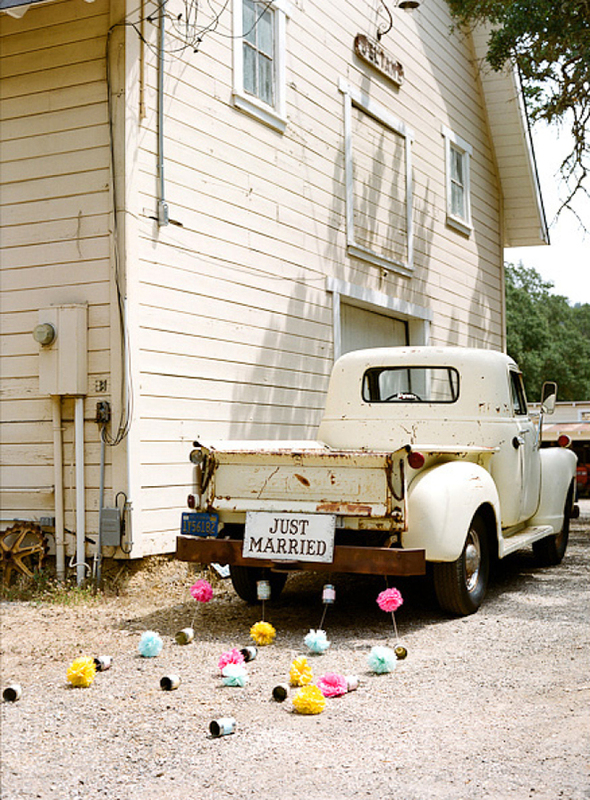 Once you’ve picked the vehicle, then comes my favorite part, the decor! 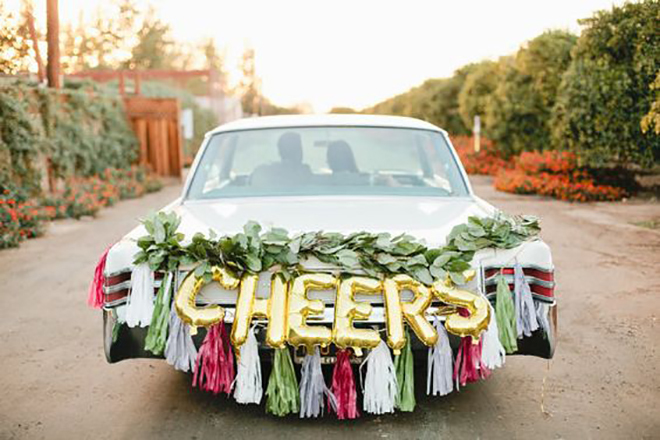 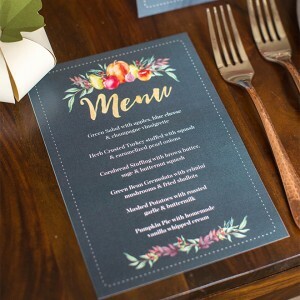 These are just 15 ideas, most can be easily DIYed with a little imagination, pom poms, tassels, tin cans and banners in any combination add life and personality to this exciting moment of your day. 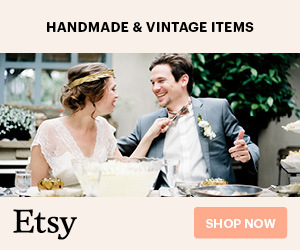 Of course most of you reading this are all about the DIY, but incase you are not, Etsy has hundreds and hundreds of options to deck out your ride. 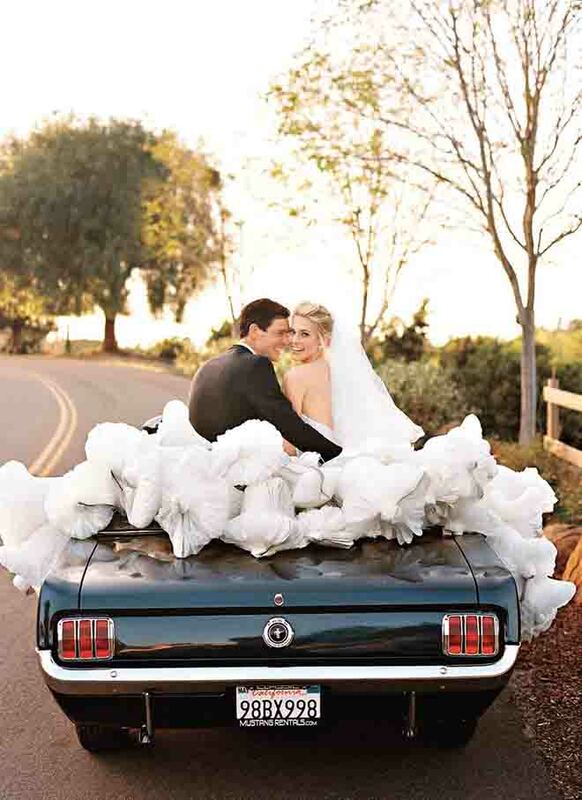 Have fun, don’t be afraid of going over board, this dramatic exit is the perfect time for it! 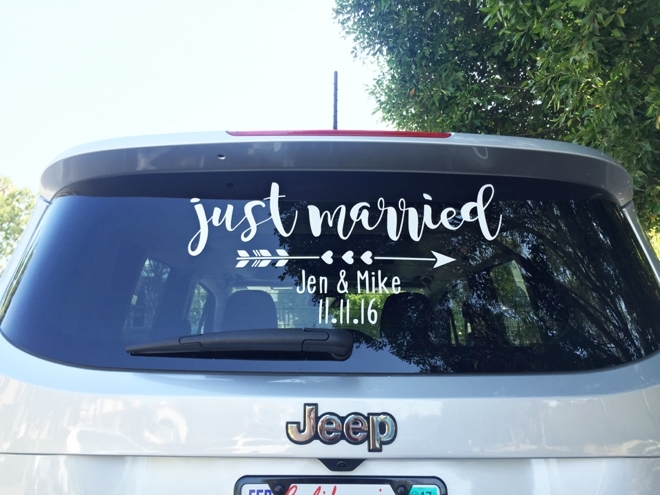 WINDOW CLING FOR THE WIN! 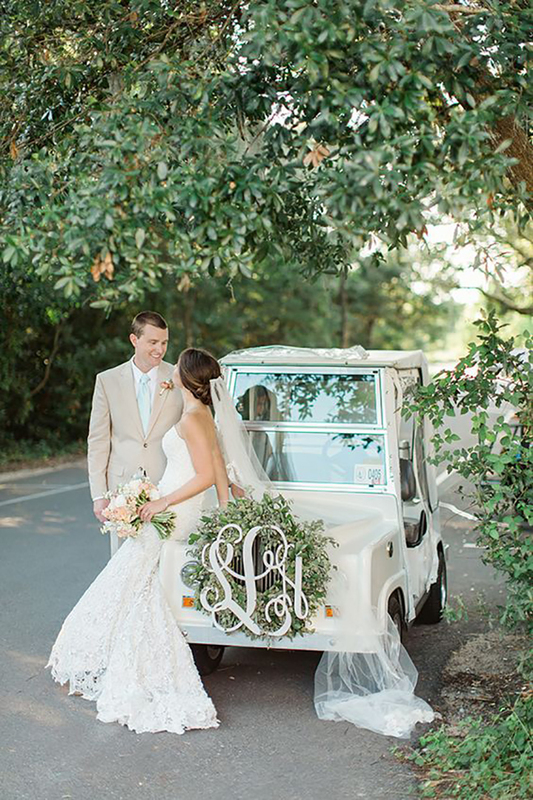 PERSONALIZED AND TRADITIONAL, WE LOVE A MONOGRAM! 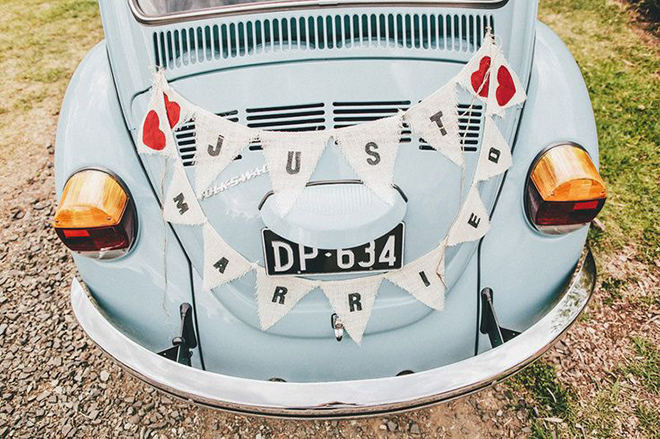 BRIGHT POMS AND RUSTIC SIGN IS PERFECTLY CHARMING!